I noticed this recipe in our newspaper a while back and then forgot about it because I couldn’t find Arctic Char at the time. (Yes, I still get and read the newspaper!) But this fish showed up at our local co-op last week and I remembered the recipe. 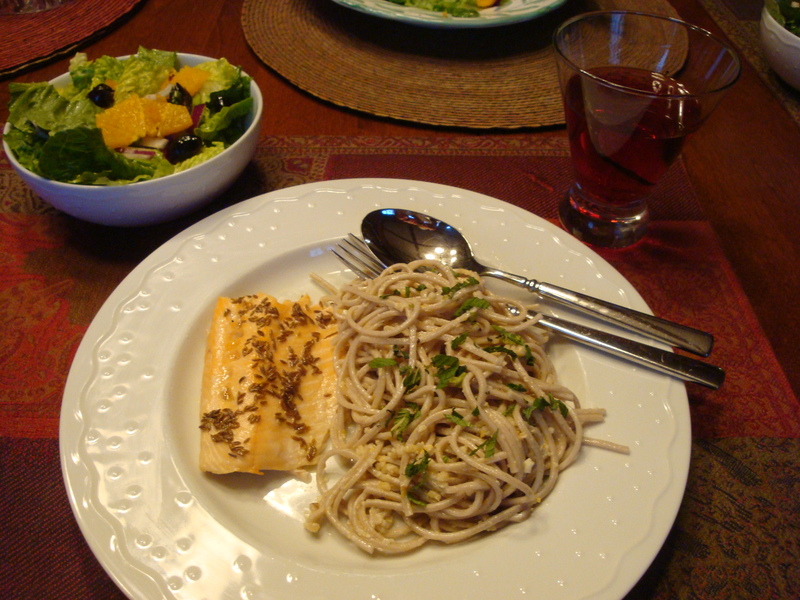 I’d never cooked with Arctic Char before – we thought it was delicious! It looks a little like salmon, but has a more delicate flavor and a creamier texture. This recipe is fast and easy to make, and the noodles can be served hot or at room temperature. We served it with Corfu Salad and a rose wine. I think it would also be good with a side of asparagus. NOTES ON INGREDIENTS: If you can’t find soba noodles (Japanese noodles made of buckwheat and wheat flour), I think thin spaghetti would work. And if you can’t find Meyer lemons – it’s getting very late in the season – you can use regular lemons. The original recipe called for 6 tablespoons of olive oil, but we thought that a bit much. Adjust to your taste. Cook the noodles according to package instructions. Rinse and drain well. Finely grind the pine nuts. You can do this with a few pulses of a food processor or use a nut grinder. You could also chop them finely with a knife. Scrape the ground pine nuts into a large bowl. Add the garlic, 1/2 teaspoon salt, pepper and lemon zest. Whisk in the lemon juice. Slowly whisk in 2-3 tablespoons oil to taste. When the noodles are finished cooking, toss them with the dressing while hot even if you will serve them room temperature. Add mint or cilantro at this point if you’d like, although the original recipe called for using the herbs just as garnish. Set a small skillet over medium-high heat and allow to heat up, about 1 minute. Add the cumin seeds and sizzle until fragrant, about 30 seconds. Turn off the heat and add remaining 2-3 tablespoons of oil. Allow to cool slightly. Season the fish with remaining salt and a pinch of pepper and place on the baking sheet. Spoon the cumin and oil evenly over the fillets. Roast to desired doneness, about 5-7 minutes for medium rare depending on thickness of the fish. Our fish was thin and done after 5 minutes. Divide the noodles among four plates and place the fish beside the noodles. Garnish with the lemon wedges and cilantro or mint.